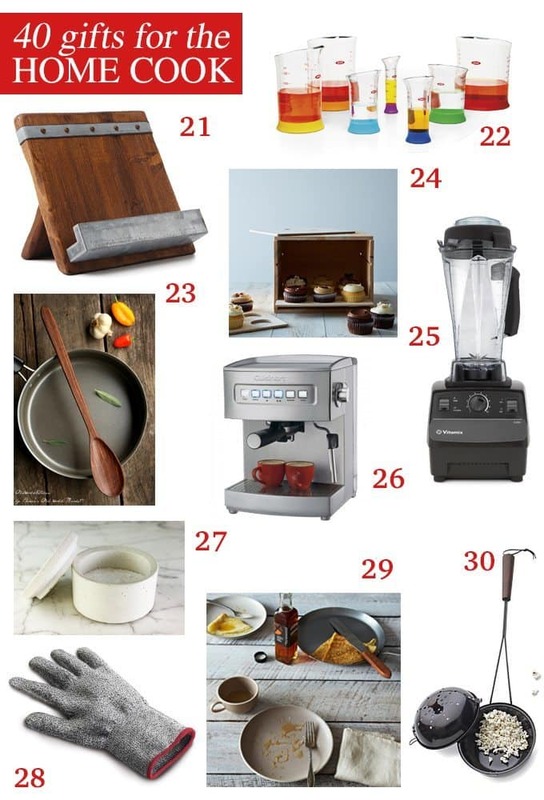 This kitchen gift guide contains 40 gifts for the home cook – perfect for amateur chefs and foodies alike! Is there a home cook on your Christmas list this year? This is great news! Home cooks (like myself) are one of the easiest people to shop for – there are so many gadgets out there that we could use or that we want! 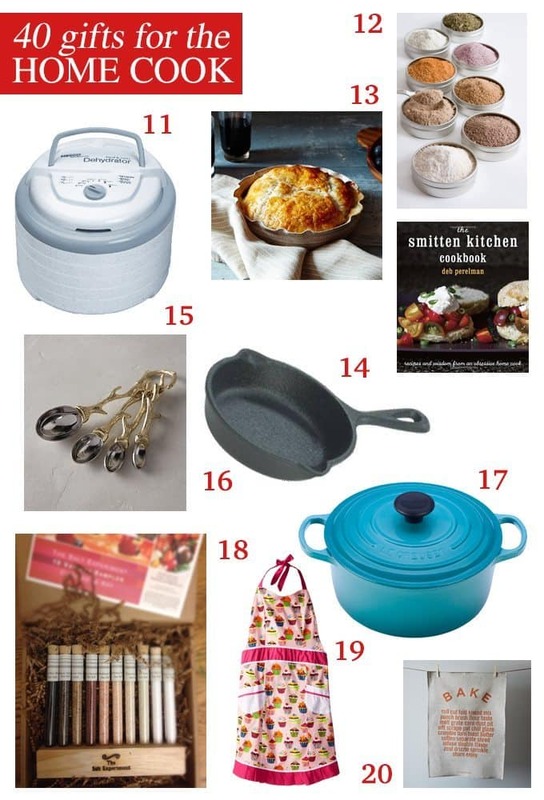 Don’t get overwhelmed this holiday season and use my gift guide to help you shop for your favorite home cook. The gifts in this gift guide range in price from $7-$550 so really there is something for every budget. 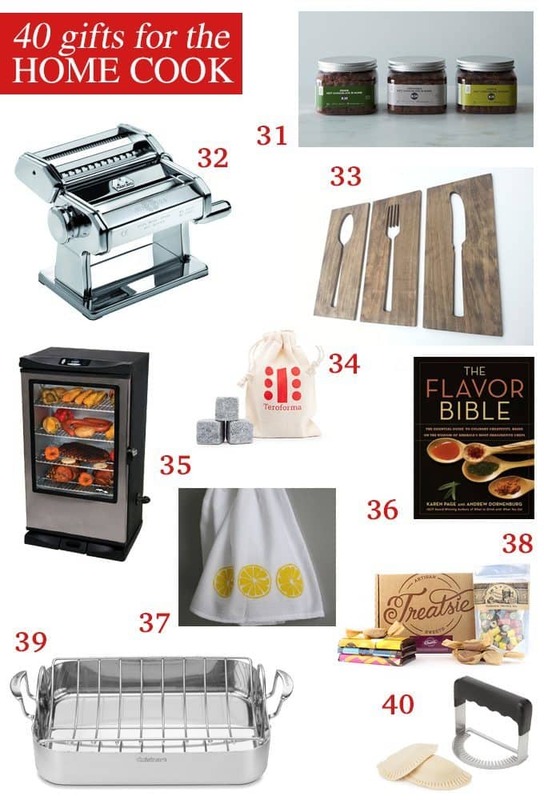 Whether you’re looking for stocking stuffers or a big group gift, pick one of these 40 gifts for the home cook. Sweet Paul is one of few sites that I maintain an email subscription to – his recipes are genuine and amazing. A subscription to his equally amazing magazine would make me very happy. Home cooks often entertain a lot – someone has to eat all of that food after all. This platter is perfect for hosting book club and dinner parties. I would recommend this for the newer home cook because every cook needs a set of mixing bowls. This set comes in multiple sizes and is dishwasher and oven safe. Artisinal foods are great as gifts because they are often more expensive than something you would buy for yourself. This pretty bottle of balsamic vinegar is made in Italy and sourced by St. Helena Olive Co. Unique pieces make for unique gifts. This turquoise serving bowl is exquisite and hand thrown! This is the same model I have, but mine is a different color. This baby will make any home cook very happy – I know I was ecstatic when I got mine. There are cheaper models, but if you’re willing to splurge a little go with the “go big or go home” motto. Many colors available! In this day and age what better way to know where your food comes from than to grow it yourself. This grow-your-own mushrooms kit is perfect for the winter because it is grown inside! This cutting board is not only utilitarian, it is also stunning. Anything with birch in its name will always draw me in but the craftsmanship is what will get me buying. I want my coffee maker to break so I can buy this. Immediately. Perfect for coffee lovers! Blogger Jessica of How Sweet It Is just published her first cookbook and it is full of fun and inventive recipes. What home cook doesn’t want a new cookbook? Canning was the fall food trend – I predict dehydrating to be next. I like it because you can throw your dehydrator foods in to sealed plastic bags and I find them easier to store than cans. Get this for the tight on space, thrifty cook. This gift sampler is perfect! You choose the flavors and it comes in a handy gift box! “What’s better than brie? Warm brie.” Enough said. The Smitten Kitchen blog was one of the very first that I read and one I continue to read everyday. The author, Deb Perleman, creates food magic. These spoons just might be too adorable to measure sugar with, but they’d be an adorable decoration in any home cook’s kitchen. I see mini skillet corn bread and individual skillet chocolate chip cookies in the future of whomever gifts this cute mini skillet. Larger sizes are also available. A 10-piece collection of gourmet sea salts from around the world is a great addition to a kitchen! And it comes with a description card detailing uses for each salt, in case you aren’t sure yourself. I never thought I would wear an apron, yet this year I have had one on more than a few times. Flour everywhere! but not on my clothes thanks to one of the aprons I was gifted. I used to wonder who would pay $20+ for a towel and why… then I bought one. Love it. My fave use is actually for rolling roll cakes, not cleaning up. Sure, there are cheaper cookbook stands out there. But are they as gorgeous as this one? I don’t know why I am love with these measuring cups, but I am. Maybe it’s because they’re stackable. Maybe it’s because they’re colorful. The seller calls the spoon “dreamware” and I bet they are right. I love stirring the pot… with a wooden spoon. If your gift recipient bakes cakes or cupcakes, this a great gift for them. They’ll be able to transport baked goodies to your house in style and safety. You’re welcome. If you’re looking for brownie points this Christmas, gifting a Vitamix will do it. It’s pricy, yes, but it’s worth every penny. Not everyone is a morning person. This espresso maker is perfect for the fuzzy-head-in-the-morning person. A little jolt of caffeine in the morning will perk you right up! Simple, yet beautiful. This would like nice on any table or counter to help keep salt or sugar handy! For the clumsy cook. Like me. 🙂 You should only have blood touch your food in a medium rare steak. Crepe-ing is a difficult task, but this pan makes it a little easier! This is the perfect gift for the home cook who never gives up! For the cook with a fireplace (or a temperate climate) – once you pop your own fresh popcorn you will never go back to the microwaved stuff! Great way to add a kick to hot cocoa, cookies, fudge, etc – basically anything where chocolate is a main ingredient. Homemade pasta?! Yes, please. Authentic pasta can be homemade with this Italian-made machine. If there is a bunch of empty space on the kitchen wall, this kitchen art will fill it nicely. Because after all that cooking you may need a beverage. Whether it be whiskey or iced tea, it’s better when it’s not watered down. Maybe this one seems a little over the top, but an experienced home cook just may be ready to take it to the next level and smoke their own meat. You know your people better than me, but I know my people would want a smoker. As many home cooks know, great cooking goes beyond following a recipe. This book helps continue your education at “home culinary school.” I keep it next to my computer and reference it several times a week. This happy little towel is ready to be put to work – multiple towels are also available with different fruit. Give the gift of sweets! Every month the vendors change for the perfect sweet indulgence. I asked my mom, my favorite home cook, what she wanted for Christmas. She wants this roasting pan. Bam. There is no way I would buy this for myself. However, if someone were to gift me with it, I would treat everyone to homemade empanadas. * At the time of this gift guide’s creation, these Etsy items were available. Because of the nature of Etsy and its handmade items, there is no guarantee that items I link to here will be available. ** I highly recommend joining Amazon Prime before ordering these items. Many are not only (way) cheaper if you are a Prime member, but also come with free 2-day shipping. 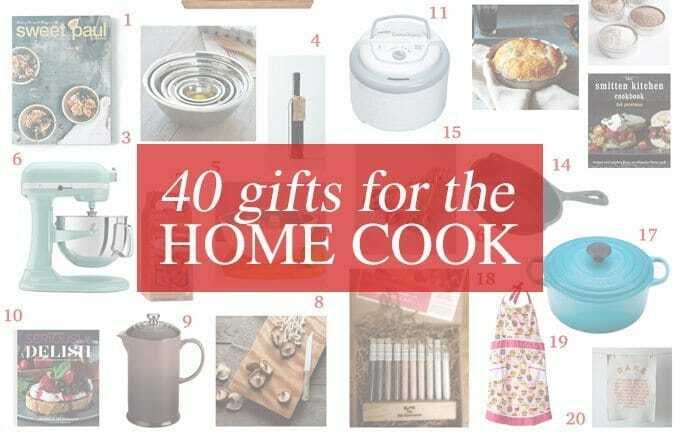 Disclaimer: 40 Gifts for the Home Cook was published in November of 2014. Price and availability were accurate at the time of posting. Honey and Birch was not paid by any company to recommend these items. Some links are affiliate links – if an item is purchased, Honey and Birch may receive a small commission. This helps keep the lights on. Great list! 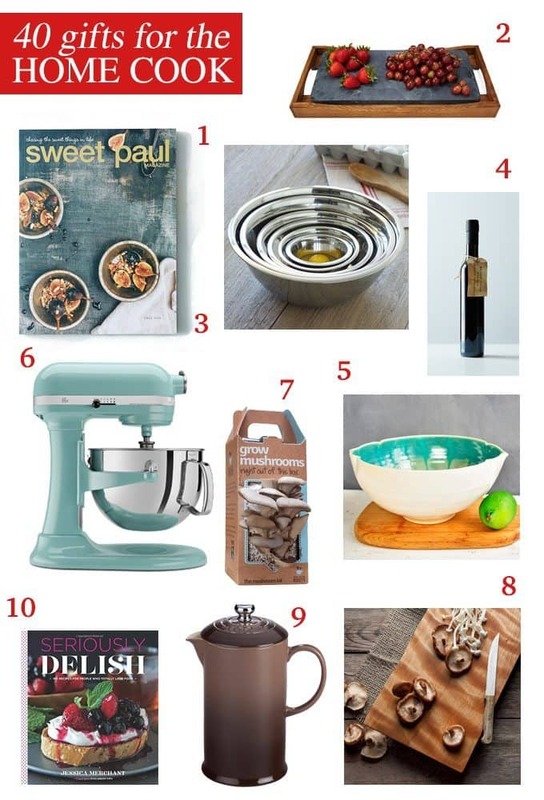 The Kitchen Aid Mixer is definitely on my wish list! Kitchenaid Professional Mixer would be perfect for my mom. She bakes the best cakes! They really are awesome mixers! Fantastic list! #11 is definitely on my wish list!